Sleek, clean lines and modern versatility combine to give you additional sleeping space for your Mexico children's room or guest bedrooms. Now you can tie together the Mission style and Rustic Contemporary elements of your Mexican decor into your child's room or guest bedroom. Take advantage of our custom stains and finishes to make this bed fit even more perfectly with your Mexico home design style and color scheme. Please order mattresses separately. 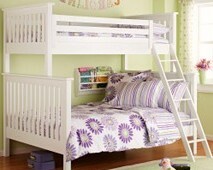 Top bunk is twin size; lower bunk is full size (we also can do both levels the same of course).